During MEC 2014 I delivered a presentation on “Backup, Restore and Disaster Recovery” in Exchange 2013. 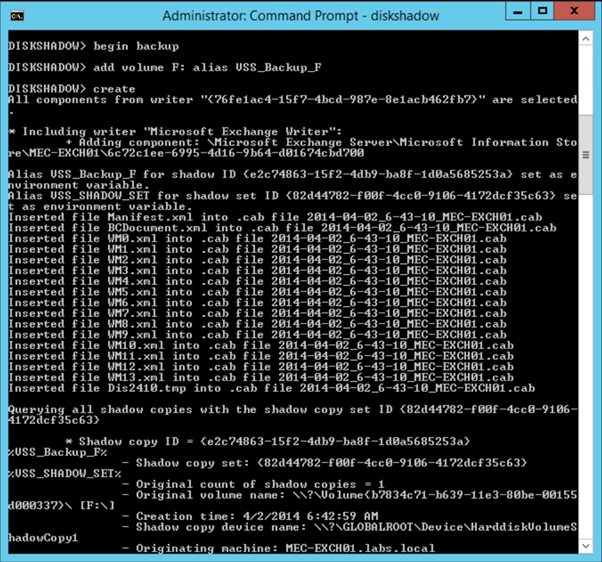 In two demos I showed replay of transaction log files and an offline backup (see previous post) and what happens when creating a VSS snapshot using the low level tool called Diskshadow. This is todays topic. 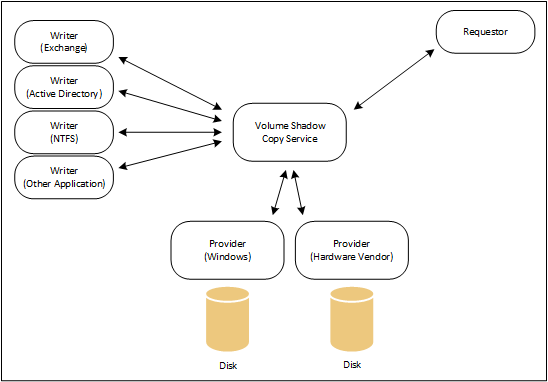 Provider – the part that controls the disk. This can be a Windows provider (provided by Microsoft) or a hardware specific provider. This is provided by a hardware vendor like HP, EMC or Dell (Equallogic) for their hardware storage solution. If you have issues with VSS backups you can always use the VSSadmin tool. In this figure the Last Error is showing “No Error” so you should be fine here. If VSS is causing headaches this is the first place to check. 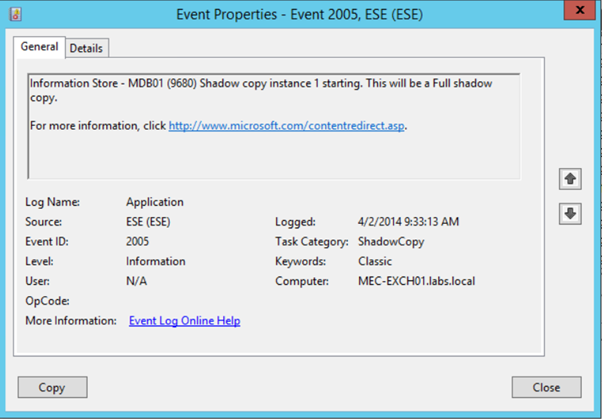 The backup application (requestor) sends a command to the VSS to make a shadow copy of the mailbox database. 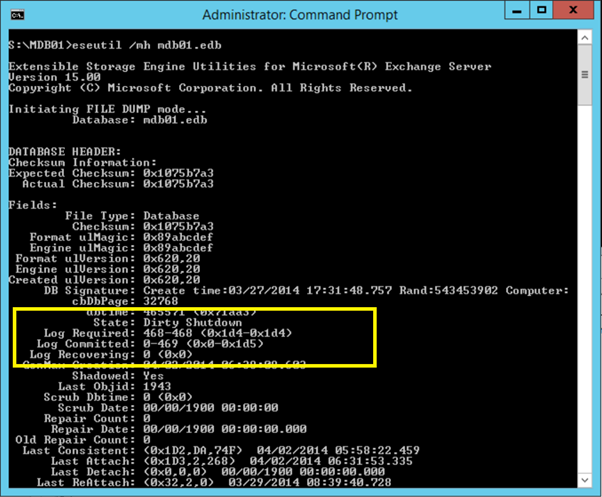 The VSS sends a command to the Exchange Writer to prepare for a snapshot backup. 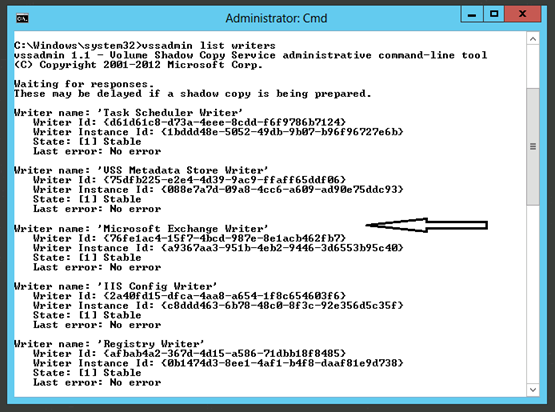 The VSS then sends a command to the appropriate provider to create a shadow copy of the mailbox database. The storage provider can be a hardware storage provider (provided by the hardware vendor) or the default Windows storage provider. The Exchange Writer temporarily stops, or quiesces, the mailbox database and puts it into read-only mode; all data in server memory is then flushed to the mailbox database. 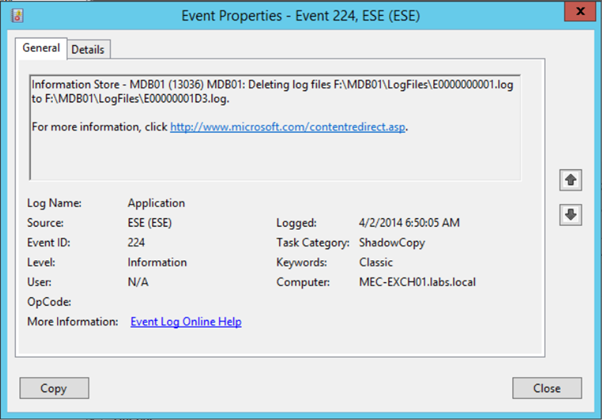 Also, a log file rollover is performed to make sure that all data will be in the backup set. This holds for a couple of seconds for the snapshot to be created (in the next step). All write IOs are queued at this point. The shadow copy is created. 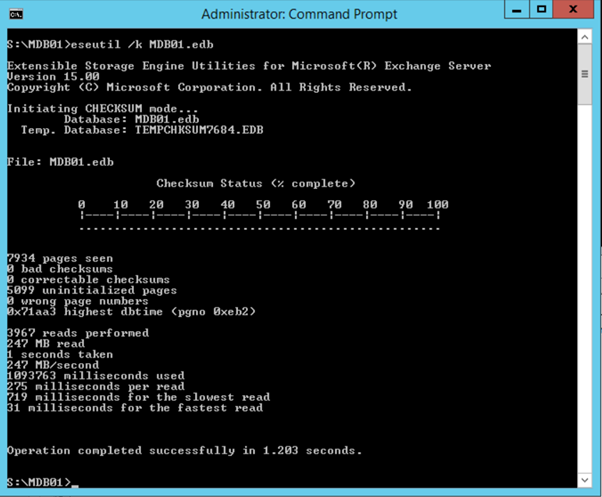 The VSS releases the Exchange Server to resume ordinary operations, and all queued write IOs are completed. The VSS queries the Exchange Writer to confirm that the write IOs were successfully held during the snapshot creation. If the write operations were not successfully held, there could be a potentially inconsistent shadow copy. If this is the case, the shadow copy is deleted and the requestor is notified of the failed snapshot. If the snapshot was successful, the requestor verifies the integrity of the backup set (the clone). If the clone integrity is good, the requestor informs Exchange Server that the snapshot was successful. The snapshot can now be transferred to a backup device. When all data is succesfully moved to the backup device, the requestor informs VSS that the backup was successful and that the log files can be purged. 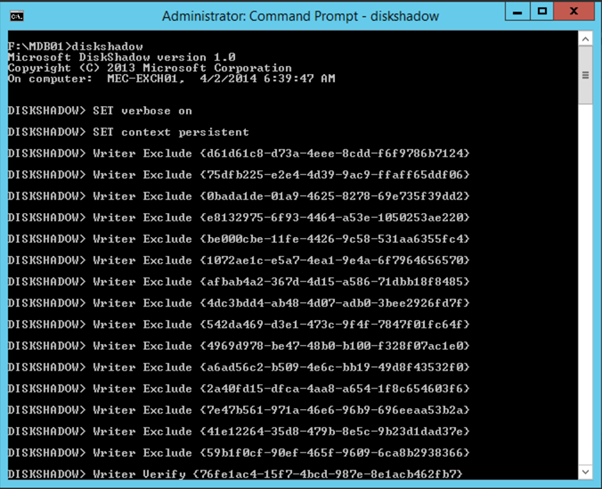 You can use the Diskshadow tool to create VSS snapshots from the command line. Please not that this is just a snapshot and not a backup solution. For a backup you need to perform additional steps as I’ll outline in the last part of this blog. This is shown in the following figure. Please note that the Writer Verify command is not shown in this figure but it is executed though. The End Backup command will actual stop the VSS snapshot process and purge the transaction log files. 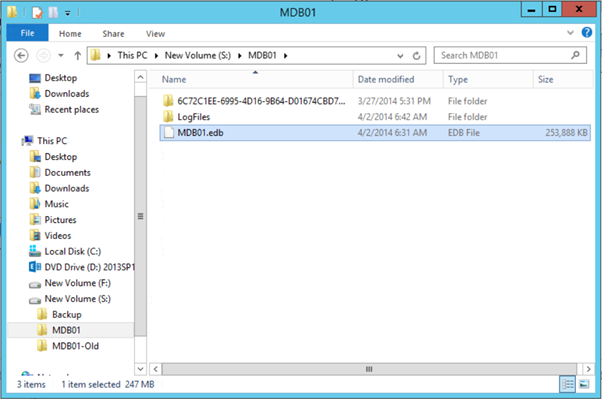 When opening Windows Explorer drive S:\ will show up, containing the actual snapshot of the Mailbox database disk. The contents of this snapshot will be read-only of course. Note. 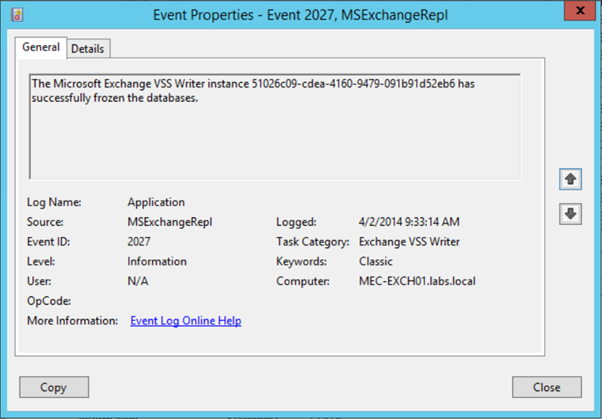 It can happen that a regular backup fails, the backup application stops but a VSS snapshot is left open on the Exchange server. It looks like you’re missing quite an amount of data from the actual disk. You can use the Diskshadow tool to get an overview of all available VSS snapshots (using the LIST SHADOWS ALL command) and if needed delete them (using the DELETE SHADOWS ALL) command. It’s best to do this after consulting with your backup vendor or Microsoft support. Another important note is that when you try this in a production environment your regular backup application most likely will notice the creation of this backup and your regular backup schedule will be messed up! This will perform all the steps as outlined above, with the exception of the unexpose of the snapshot and the deletion of the snapshot of course. These need to be executed later on when you’re finished. These commands however are in the textfile (but they are commented). If this registry entry is created and its value is set to 1, application backup will not be affected by the virtual machine backup operation on the server that is running Hyper-V. In this blogpost, following my presentation at MEC 2014, I tried to explain what’s happening during a VSS snapshot creation. You can do this (in a lab environment) to see for yourself what’s happening under the hood. There are (few) people who actually use this technique to create backups from their environment, but this is not something I would recommend to do.